You are here: Home / Blog / Where does carbon monoxide come from? Where does carbon monoxide come from? and more carbon dioxide facts. We hope this article helps you understand the dangers of carbon dioxide and what you can do to ensure you are protected from this invisible killer. Carbon Monoxide or CO, is an odorless, colorless toxic gas produced as a result of an incomplete combustion of materials containing carbon such as wood or even plastic. Carbon Monoxide is highly flammable. It is slightly denser than air and its structure is made up of one Carbon atom and one oxygen atom. These atoms are interlinked by a triple bond made up of two covalent bonds and one dative (two-electron) covalent bond. Carbon Monoxide forms when there lacks the oxygen required for carbon dioxide to be produced. This may be the case when a fire occurs, or should a combustion engine be operated in an enclosed space. 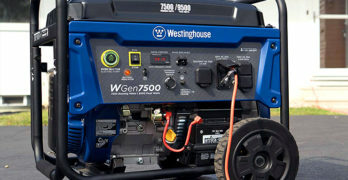 Far too many people die each year from using their generator indoors. Though naturally produced in low quantities by our metabolism, it is highly toxic in densities over 35 ppm and severe CO intoxication is most often fatal. Being in the presence of burning coal and inhaling the fumes may lead to mild to severe carbon monoxide poisoning. This is the leading cause of air-poisoning related deaths, particularly in largely industrial countries. It must however be noted almost a third of such deaths happen in domestic situations. Though most CO-induced deaths result from fires, a significant portion is due to constant exposure to automobile exhaust, or improperly vented water heaters, as well as the fumes from charcoal grills and common stoves. Poisoning may also be caused by the inhaling of degreaser, solvent and paint-remover vapors. Due to how difficult fires may be to prevent, you or your loved ones could also be at risk in your day-to-day life. When exposed to CO fumes, the poison binds to your hemoglobin (iron carrying oxygen in red-blood cells) and replaces its oxygen. It is absorbed through the lungs, which besides starving your body of oxygen, can lead to hypoxic injury and nervous system damage. It is reported that different people may have different tolerance levels of the toxic gas. Smokers, for instance, due to their constant exposure, may grow a relatively higher tolerance while children generally are particularly sensitive. CO intoxication starts at an exposure of 0.0035% Carbon Monoxide air concentration. Being relatively mild, this exposure usually only leads to headache and dizziness, but may have long-term nefarious effects on your body. Should you be exposed to higher concentrations, you may faint, fall into a coma, or even faint. It is then imperative to avoid getting into such situations, or to prevent the further spreading of a fire. If you’re brought to an emergency room with suspected carbon monoxide poisoning, you may begin treatment immediately, because time is crucial in such cases. Your doctor will order the following tests to check for the amount of carbon monoxide (CO) in your blood. These tests are essential to confirm your diagnosis and to have a better understanding of the amount of carbon monoxide you were subjected to. While testing for carbon monoxide poisoning is relatively easy, it is in definite last resort. This will be done by your doctors soon as you’re brought to the emergency room with the suspicion or a noticeable case of CO poisoning. If you are brought into the hospital too late and your intoxication is acute, there could be very little to be done in order to help you. Sad, but true. For these reasons, it is entirely safer and wiser to prevent poisoning by frequently testing for carbon monoxide presence in the air. Vigilance regarding wood-burning stoves may prevent a few incidents, but many incidents occur at night, while you are sleeping. Installing a carbon monoxide detector in each room, as well as hallways and corridors of a building or house, will limit the risks of toxic smoke spreading without your knowledge. A variety of detectors exist, and they each have different qualities and levels of efficiency. It is then imperative to do the appropriate research before choosing one, to ensure the model you pick is most likely to detect any worrisome smoke presence, while alleviating you of the fear a fire may erupt without your knowledge. It is advised to follow every manufacturer’s instruction when installing the detector, and making sure the right batteries are used and frequently changed. However, even with such precautions, for the best detector performance, you must choose the best model. Nest Protect has a friendly human voice that gives you an early warning, preventing an incident like burning toast from turning into a disaster like a burning toaster. It talks to you and tells you exactly what’s wrong and where. Cool! This sleek, re-designed model has a hyper-sensitive industrial grade smoke-sensor. Its features, in line with technological advancements, facilitate controlling the device from a distance. The detector can be silenced from your phone should it go off in case of smoke presence in the house, or merely chirp when the batteries require to be changed. You will also receive alerts on your phone that will report the exact problem, facilitating simultaneously requesting for assistance. The Nest Detector features a warm, calming human voice that will give you warnings in a time-appropriate sequence. The detector also sees both fast and slow burning fires with its two wavelengths of light which sense smoke from smolder and aggressive flames alike. Though the sensor is reported to be able to work up to a decade, the Nest Detector autonomously uses a discreet sound check to ensure its sirens and speakers are working once every month. The sensor itself and the batteries are checked by the device 400 times a day. A popular feature of the Nest Protect is its bright pathlight to guide your way along corridors at night, programmed to remember and reproduce your usual path. A comforting way to get yourself a glass of water or milk from the kitchen, it is a nice touch that may seamlessly incorporate the Nest as part of your house’s design. You may also enjoy its use of special algorithms and humidity sensors to differentiate between smoke and steam, thus enabling you to shower in peace. Working hand in hand with other Nest products to protect your house, this detector is widely acclaimed as the most efficient on the market. Should you need further information about Carbon Monoxide poisoning or the Nest 2nd Generation Smoke Detector, contact us today. We will be glad to be of assistance.